Add some mood to your florals with this stunning style by Talulah! Crafted in pastel toned florals on a black base, we adore the dramatic plunging neckline and sheer ruffled sleeves! The slightly flutes hemline gives this midi a flattering silhouette, making it perfect to hire for your next race day or cocktail evening! 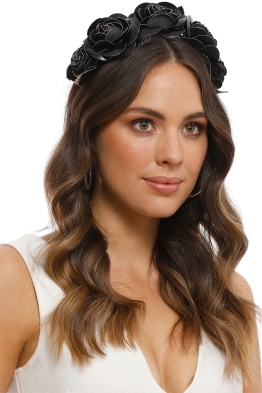 Style with loose waves and a pink lip for a pretty look! 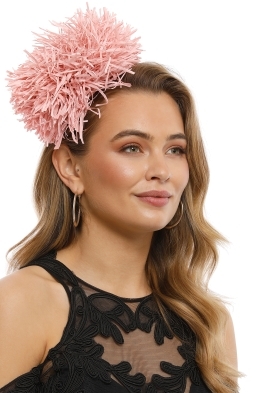 Pull out the pastels of the print by renting this perfectly pink fascinator to accompany your look! 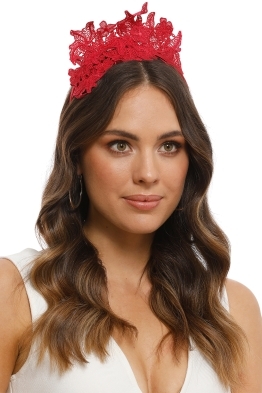 Read our Spring Racing Style Guide for our favourite floral tips! UNDERGARMENTS: Consider wearing silicone cups to minimise lines. GREAT FOR: Hourglass, Straight, Tall body types. Seguro Midi Dress is rated 4.7 out of 5 by 7. Rated 5 out of 5 by Elizabeth from Perfect for summer wedding I loved wearing this dress! It was a little large and hollywood tape was definitely required but in 37 degree heat, the extra space was a blessing. The material is lovely and flowy and the length perfectly hit my mid-calf. The neckline is obviously extremely revealing but I found it to be super flattering. I was a little worried about the slip under the skirt being too revealing but it was a great fit and I didn't have to worry about it riding up at all. Overall, a perfect dress for a summer wedding. Rated 5 out of 5 by Zoe from Great Dress! This was a back up dress. Loved the colours and material. I would have loved to wear it but other dress hired was slightly more appropriate for the occasion. No bra, with hollywood tape recommended.I will definitely rent this again for another event! Rated 5 out of 5 by Sarah from Elegant dress for a garden wedding at winery I wore this dress to a beautiful garden wedding. It was my first time hiring a dress and I was a bit nervous about it but GC turned out to be a truly fantastic experience. The dresses arrived beautifully packaged and I received many compliments on the stunning dress I chose. Will definitely be using GC for all my upcoming events. Rated 5 out of 5 by Kellie from Great dress for a spring wedding Customer service from GC was A+... this dress was top big so they express posted the smaller size overnight to me in time for the event. Rated 4 out of 5 by Catherine from Lovely dress for wedding guest Gorgeous dress for a wedding guest. Really deep in the chest - Hollywood tape is a must! Dress definitely runs large. The 10 fit great on a usual size 12. Rated 4 out of 5 by CLAIRE from Beautiful fabric, unfortunately too big! Didn't end up wearing this as it was too big, I am 163cm and think it would suit someone taller and broader than I am as the V neck sat much lower than in pictures and gaped too much to tape. Loved the ruffled sleeves.